In the original proposal for this project we said we'd do a blog to record the process. Actually, in the end, a blog didn't seem the most appropriate thing (the most-recent-first arrangement of blogs might not be the most user-friendly, and we doubted that it would really have an audience). So instead here is a diary which reflects on the process ... and includes some videos. This part was straightforward and was mostly just a lot of planning: arranging for a number of schools up and down the country to participate, and working out all the logistics. We also experimented with some materials which could possibly be used for the three-dimensional creative activities in the workshops. Ultimately we decided that actually there was no need to be prescriptive about materials. Instead, we would provide a wide range of craft materials, and also would welcome participants adding anything else that they might want to use. We had to produce some 'example' identity boxes, having been strongly advised by teachers that some kind of example, for the students to see (but not copy! ), would be helpful. We continue to do workshops at schools in Newcastle, Manchester, London, Southampton, Christchurch, and Cumbria. Rob Walker, from the University of East Anglia, one of our friends from the ESRC Visual Methods workshops, told us about a project he's been working on where young people were asked to develop ideas for how a rather old-fashioned museum in Norwich should be transformed to be more engaging for today's visitors. A group of school pupils worked on this over several weeks, doing a range of activities, and visiting other museums to get ideas. The researchers employed a filmmaker to document the process, and she put together a number of interesting films. [We previously included the videos, hosted on YouTube, on this page, but unfortunately they have now been removed by their creator, for some reason]. In one example, the school students are working with university architecture students to design the museum space. In the video, that work is actually happening in other rooms. What you see is material from a 'diary room', which participants could drop into, to record what they were up to just by pressing 'record' and speaking to the camera. Participants were very familiar with the Big Brother idea of a diary room, and created fascinating material. I highlighted these here as they were a great example of YouTube-sized dissemination, and a source of inspiration! (Shame they're no longer on YouTube). Today we ran a workshop for the RSA - the Royal Society for the encouragement of Arts, Manufactures and Commerce - to think through how its 27,000 Fellows might find new ways to connect, collaborate, and work on projects together. This was an opportunity to try out slightly different materials and ways of working. The materials provided were Lego and Plasticine - plus some objects that some of the participants had brought along to represent their aspirations for the network. The process was faster than we typically do, and somewhat difficult to handle with four groups working simultaneously! But it seemed to go pretty well. Here is a video which mostly focuses on the method and process - including examples of the metaphorical models, explained by the participants. Today we ran a workshop in which potential first-time voters (also known as first-year University of Westminster media students) built visions of what a parliament of the future should be like. Rather than just discussing the topic, they created metaphorical models representing their ideas in Lego. This was an opportunity to try out the Lego method in a different kind of way (working in groups from the start) and on an unusual topic. This particular workshop on parliamentary futures was in collaboration with the Hansard Society ('the UK’s leading independent, non-partisan political research and education charity'). They emailed asking if we might be able to gather together some students to do a conventional focus group... I replied asking if we could perhaps use different methods to explore the topic... and thus a collaboration was born. The Lego method produced richer findings than I would expect to get from just a group discussion - and the students themselves, as well as the Hansard Society researchers, agreed that this seemed to be the case. Parliament should be transparent and open. Parliament needs to communicate with the public, and needs innovative thinking about how to do this. Parliament also needs to listen, and needs systems to capture the views of the public. Parliament should be accessible, and politicians should be visible as members of the ‘real world’. There should be a drive for consensus, rather than party-political battles. Wisdom, integrity and trust are essential values. Education about politics is vital. Participants said that school students should be educated about politics from an early age - even if they thought they didn’t want it at the time - as it was so important. Overall participants wanted to feel more connected with politics, and to feel that politicians were responsive to their needs and interests. Communication, again, would be at the heart of this. A very interesting three-hour workshop, which seemed to fly by! Fatimah Awan writes: On arriving in Alston the first thing that struck me was its quaint appearance, the beautiful landscapes and the village's isolated position. Located in the foothills of the North Pennines - at a junction for motorways that run through the mountains - Alston claims to be highest market village in Britain (being approximately 1000 feet above sea level), is noted for its steep cobbled main street and 17th century stone buildings, and is situated about 20 miles from Carlisle: the nearest town. Having only previously worked with young people from schools in inner city areas I was keen to meet young people who lived in rural locations; and intrigued to see what types of work they would create and whether these would differ significantly from those produced by young people who resided in cities. Samuel King's School is a very small 11-16 secondary school, consisting of 204 pupils from Alston and surrounding villages and hamlets across Cumbria and Northumbria. However, given the remoteness of the school's location, I was impressed by their technology resources - almost every classroom had computers (a ratio of one computer per student) and pupils are actively encouraged to use a virtual learning environment available on the school's website. This has been aided by the Cybermoor project which seeks to connect rural communities to the World Wide Web (every household in Alston was given a free PC and internet access, as well as practical training on how to use the internet). 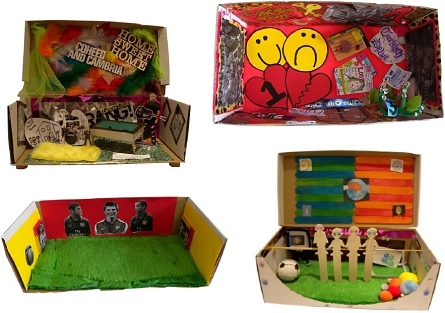 The young people were excited about participating in the research project; and feedback from them suggested that they enjoyed making their identity boxes as well as having the opportunity to express their identities and the role of media in their everyday lives. Perhaps unsurprisingly the young people engaged in using a variety of media including Web 2.0 tools such as Facebook, MySpace and YouTube - as those in inner cities did - but preliminary findings seem to indicate that there are fundamental differences in how and why young people from rural areas utilise the media compared to their inner city counterparts. This is an issue that the research will obviously explore at a later stage. Fatimah Awan writes: Willowfield School is located in Walthamstow, East London, and attended by 588 11-16 year olds from ethnically diverse backgrounds: students with a Pakistani heritage constituting the largest group. For many pupils English is an additional language: Urdu and Punjabi being predominantly spoken amongst the student cohort. The school has two large computer suites as well as computer facilities in two science classrooms for pupils to use and, as many other secondary schools, has a virtual learning space on their website that students can access for assistance with their coursework. On the whole the young people I worked with at the school were enthusiastic about creating their identity boxes using the wide selection of art materials that were supplied (as well as anything else they wanted to add), with some utilising metaphors in interesting ways to express their identities and the place of media in their lives. However, the interviews proved more challenging as some of the young people were initially hesitant to discuss their work and needed reassurance that what they said was not being assessed - once this was addressed (as it was in all cases) they were happy to discuss their thoughts and feelings openly. Interestingly, and deviating from a pattern which seemed to be establishing itself among many other young people, the majority of these young people seemed to emphasise the role of television in their lives and gained enjoyment from watching it for a variety of reasons. Following the completion of the fieldwork, this next phase of the project involves transcribing the 138 interviews which have been conducted with young people across the UK. Fatimah Awan writes: Having completed the fieldwork and being confronted with a very big pile of transcribed interviews, I now face the task of trying to analyse this data over the coming months. I decided to undertake a training course in NVivo in the hope that it would assist me with the management of this data; however, I have found that adopting a manual ‘hands on’ approach enables me to immerse myself in the data and become familiar with the participants voices. This is not to suggest that NVivo does not have its benefits (which, of course it does), but for the purposes of this project I believe it is perhaps not the best approach to take. For example, on the surface I have noticed that a lot of the findings may appear rather ‘obvious’ (e.g. music plays a significant role in the lives of both urban and rural young people), but when I look closer at what the participants are saying differences do emerge (e.g. urban participants articulate the importance of a song’s lyrics as a means of authentically communicating their own experiences whereas rural participants make no personal or direct association with the lyrical content of songs). As such, I feel the manual approach will not only allow me to get closer to participants own understandings of the place of media in their lives, but will also allow me to gain more nuanced and richer understandings of the issues at hand. Today, David and Fatimah presented details of the project and some preliminary findings at the MeCCSA 2010 Conference (LSE, London). The reception to the presentation was very encouraging, and our use of creative methods provoked some interesting questions. Having completed the data analysis, and held a number of meetings about our work, we have decided to dedicate the remainder of the time on this project to writing up our findings. We currently anticipate producing three articles for journal publication, and David is also working on a book, Making is Connecting, which deals with themes relevant to this project (see: http://www.makingisconnecting.org). Fatimah Awan writes: Today I delivered a paper at the IAMCR 2010 Conference (Braga, Portugal) which was titled ‘Exploring online experiences of young people in rural areas’ (this was a revised and updated version of a paper which was presented at the MeCCSA 2010 Conference in January 2010). The paper formed part of a panel which was centred upon methodological experiences and innovations in audience research. Within the presentation I discussed the valuable aspects of creative methods, before moving on to outline the project in greater detail and highlighting the research findings on young people in rural areas – specifically focusing on their relationship with new media. The paper was well received with a number of individuals expressing an interest in adopting creative methods in their future research, and others wanting to know more about the experiences of young people in rural areas (the concept of ‘double isolation’ generated much interest!). In general, the session was stimulating and engaging, and raised a number of methodological issues which would be worth considering in future work. You can view the slides from the IAMCR presentation here (as a PDF file, 0.9mb). As the project draws to an end, and writing up results continues, a one-day symposium has been scheduled for 15th September 2010 which will not only discuss findings from this research project, but will also have a number of speakers presenting their work on young people’s use of media in their everyday lives. The symposium is called Young People’s Media Use and Creative Participation, and takes place in The Boardroom, University of Westminster, 309 Regent Street, London. The discussions will place particular emphasis on whether making and sharing media material online does – or does not – make a difference, and should provide some lively and informative debates. You can also view the symposium programme, including information about the speakers, here (PDF file, 0.1mb). Update: All 125 tickets have now gone. The project is funded by the Arts and Humanities Research Council. This project builds on the work on new research methods outlined in the book Creative Explorations (2007). A timetable for the research project appears with the project outline.